A little while ago we decided that it was time for our beloved rescue Doberman Skylar to have his first off leash run. He has been running free in fenced in dog parks, but never in an open space area. We have Skylar a year this month and we hoped we can trust him by now to stay around and not take off once his leash is unhocked. Skylar is still easily distracted and very flighty in case something scares him and he is not good on recall, so my husband and I were a little concerned about the whole thing. Admittedly especially I was very nervous, but on the other hand we didn't want to deny him to run free any longer. To ease the situation we called on our trusted dog trainer, Alexandra Gant, and scheduled a session with her to help us at least do the right things from our side and decrease our nervousness just by her calm presence. We decided to go to Fiesta Island here in San Diego, which is a huge recreational area right by a bay at the sea. There is also a big dog park on the island, which is kind of semi fenced in. The dog park is so vast that the dog can get completely out of sight and if it absolutely wants to can go around the fences. So the dog will have the feeling it is truly free, but there is at least some protection given. Alexandra brought her own rescue dog with her, Arya, her Coydog as she calls her. Arya is a mix between a Coyote and a Husky. Skylar and Arya know each other and get along well and we believed that they will give each other some confidence and hang out with each other and hopefully us, too, and not take off alone or with another dog. So the plan was made and off we went. If you are holding your breath by now, I can already tell you that things went well. Yes, the dogs went out of sight one or two times but they came back. Altogether Skylar stayed much closer to us than we expected and didn't take advantage of the situation that he could take off. When we reached the sea level something amazing happened: Our water shy dog went into the water the very first time! It was so lovely to observe these two dogs enjoying their freedom to run and play in the water. Skylar: "What, are you really going in there?" Arya: "Yes, not a big deal, it is actually fun!" Skylar: "Alright, you lead, I will follow." Arya: "Let's catch the waves!" Skylar: "I do what you do!" Skylar: "This stuff smells wired". Skylar: "But all in all the water is not too bad." Skylar: "Catch me if you can!" Skylar: "Playing in the water is fun indeed!" Arya: "I am done with this!" Skylar: "What, are you tired already?" Skylar: "Mom, Dad, she doesn't want to play with my anymore. Do you want to play?" ...maybe I get to chase her one more time." ...OK then I play catching the waves by myself." Two tired happy dogs ready to be leashed up, again. Two happy dog owners and one of them in addition to being happy also very relieved, that's obviously being me, ready to go home. Phew, for the first time the off leash run went rather great! We will certainly do it again and this time alone. A big thank you to Alexandra for helping us one more time to make the next step forward in our journey with Skylar and to support him to be a happy, confident and well-behaved dog. 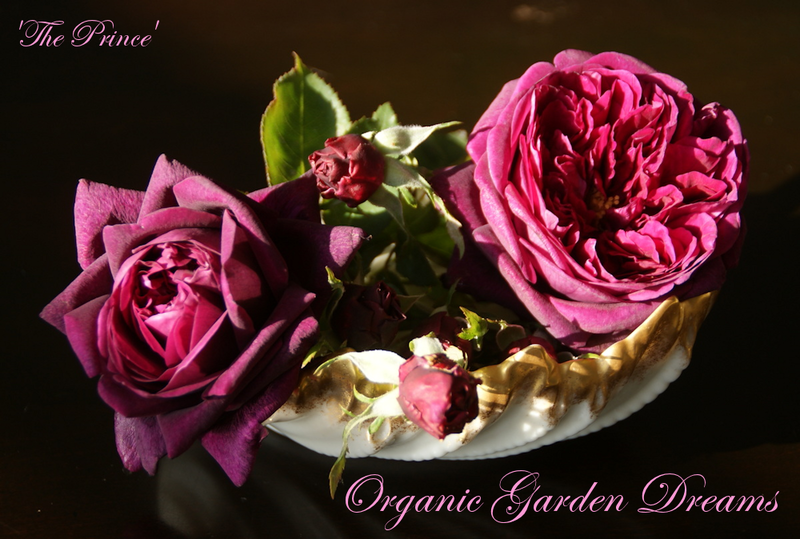 Wishing everyone lovely, calm last days of in the old year! Garden Tour through the Backyard: There are still some Roses blooming! Here is the latest of my garden videos. It is done a little while ago, but not much has changed in the garden and it looks right now almost like you see it in the video. So I thought I will publish it. It is a narrated tour through my backyard and I am featuring roses that were blooming at that time. You will meet besides others 'Stephen's Big Purple', 'Snowbird', 'Rhodologue Jules Gravereaux', 'Scepter'd Isle' and 'Mister Lincoln'. I am also visiting other plants like for example coleus 'Wasabi', iris 'Platinum', my camellias and alstroemeria Princess Lilies 'Claire'. Thanks for watching! I really appreciate that you took the time to have a look. Before I leave you, I have to tell you that it is raining right now in San Diego and the weather forecasts predicts that it will continue to do so all day long with short interruptions. That is certainly an early Christmas present and it makes my hope grow that I will have some lovely roses blooming next year, too. If you celebrate Christmas, I hope you enjoy your Christmas preparations and that it didn't get too hectic for you! And just in case I don't get to blog anymore: I am wishing you and your loved ones a very Merry Christmas! Because of late autumn and also due to the fact that rose pruning has started yesterday, my garden looks quite bare and is deprived of its rose blooms. I miss them already and can't wait for the spring flush next year. But I thought I could help myself out and go through my photos of Mottisfont Abbey, one of the most beautiful rose gardens that I know of. 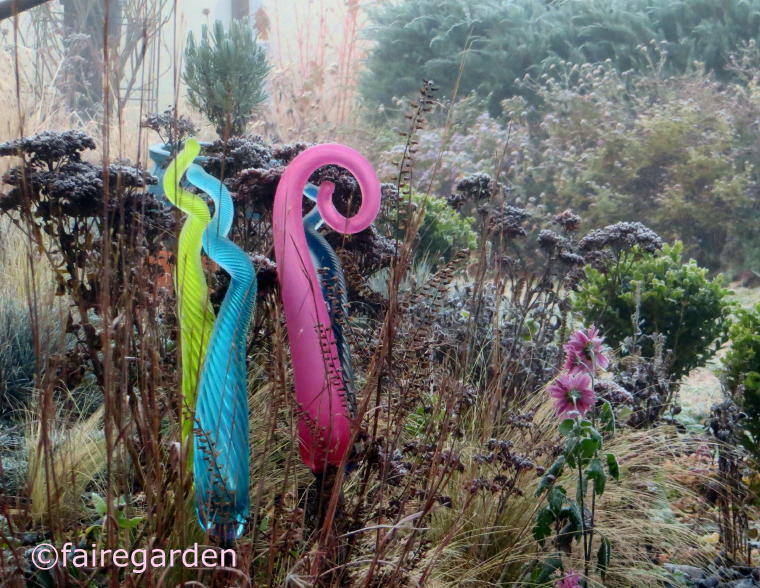 A good reason to continue my series about this great garden on my blog and write up a new post. 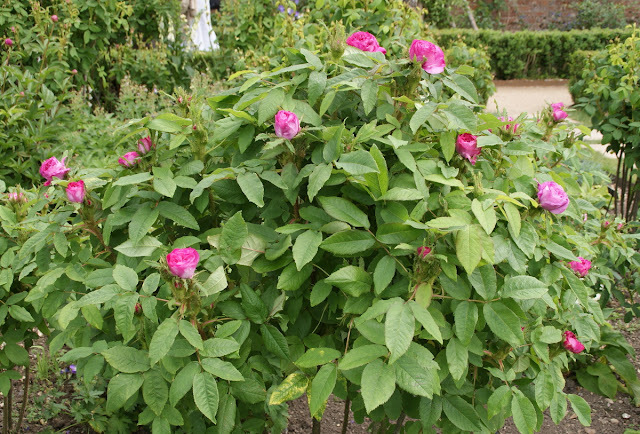 In this entry I am featuring some rare roses that are growing at Mottisfont, that you are not very likely to have seen ever before. So I hope I have some surprises in store even for the most knowledgeable rose enthusiasts. I am so glad that Mottisfont Abbey is preserving these beauties for the future for all of us to enjoy. One rose beauty that I couldn't find a label of. I like the careless, frilly and playful look of the flowers. 'Lady Waterlow', a climbing Hybrid Tea rose bred by Paul Nabonnand and/or Clement Nabonnand (France, 1902). This was a rose that simply blew my mind. We must have been lucky and visited Mottisfont when 'Lady Waterlow' was at her absolute peak. Once again you can see on the photo how perfect the climbing roses are trained at Mottisfont for maximum bloom production. Each semi-double bloom of 'Lady Waterlow' is simply gorgeous! The pink blend coloration of the flowers is so subtle, you can't help but fall in love with them. The rose is suppose to have a strong fragrance, which I can't vouch for, since I couldn't get to it. In Mottisfont many peonies are growing together with the roses and lots of them were in bloom when we visiting Unfortunately I don't know the name of this variety. ...they are displayed together with many different companion plants. I feel that only enhances the beauty of the roses. Loved this combination of dark burgundy and white colored peonies and white foxgloves. A wide shot of another flower bed. A rose that you don't see that often is 'Gloire des Mousseux', a Moss Rose, bred in 1852 by Jean Laffay and/or M. Robert in France. 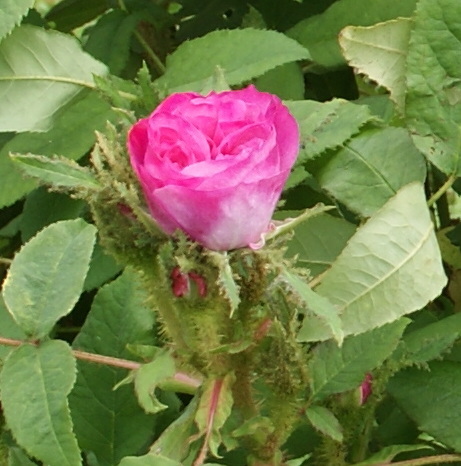 ...the real attraction of this rose is the moss on the buds. It is quite pronounced. And another lovely peony bloom. 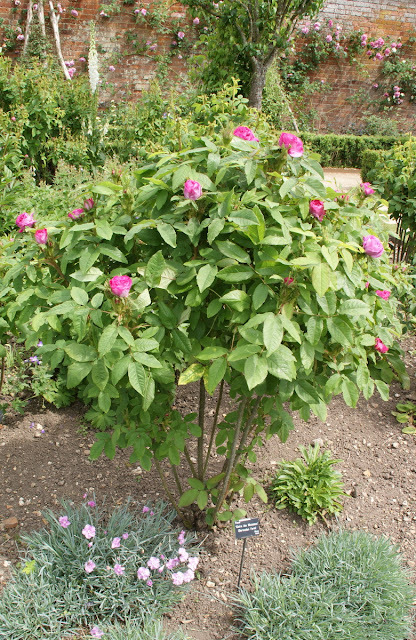 A China Rose that I saw the very first time in my life is 'Mme Laurette Messimy'. The rose is assumed to be bred by Jean Baptiste Andre Guillot and/or Pierre Guillot in France, 1887. The semi double flowers are pink, but have beautiful yellow undertones. One characteristic is that the buds are unusually long. Here is a whole bush shot of 'Mme Laurette Messimy'. I think it is a rose with a very unique appearance and charm. Another rose that I don't have an identity of, but it reminds me of the Tea Rose 'Le Vesuve'. At this point, I still remember even though our visit was two years ago, we were totally saturated with impressions and couldn't take in anymore. ...and took a break at the tea room. Of course, we didn't have only tea but cake as well. I recall having a ultra delicious walnut cake. Yum! 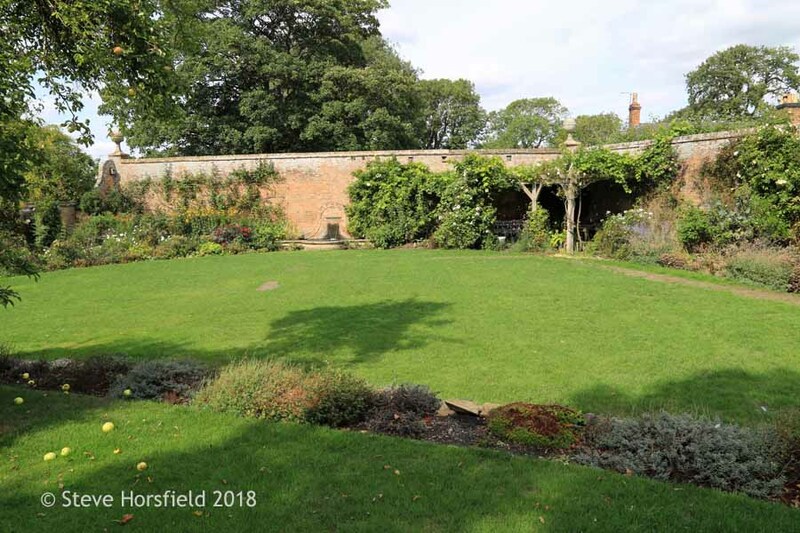 After we had rested for a while and restored our energy and our capacity to take in more rose beauty, we headed back to the rose gardens and started to explore the third walled rose garden of Mottisfont Abbey. The combination of lavender and white colors spoke to me in this bed. A charming white rose that unfortunately I have no Identity of. Close-up of an Allium head. Does anyone know what the white delicate flowering plant is in the background? The romantic planting style of Mottisfont is hard to top. You can't help but being in awe of the giant Allium heads. They have such a dramatic impact in this bed.